Joseph Zweben, a resident of Sun City since 1978, died peacefully on March 30, 2017. Joe was the first son of Russian Jewish immigrant parents who came to the U.S. after WW1 with two daughters. Joe was born in New York in 1921 and grew up in the tenements of the Lower East Side, and in the Bronx, and Brooklyn. He played street hockey and basketball and was a star basketball player in high school. After graduation he worked his way cross-country to California and back, married his sweetheart Berta Hecter of Brooklyn, and enlisted in the Air Corps right after Pearl Harbor. Joe served over four years with the rank of staff sergeant, in North Africa, Italy, and the Middle East. He wrote and edited news and features for his units’ newspaper “Prop Wash”, while serving at many air bases during WW2. 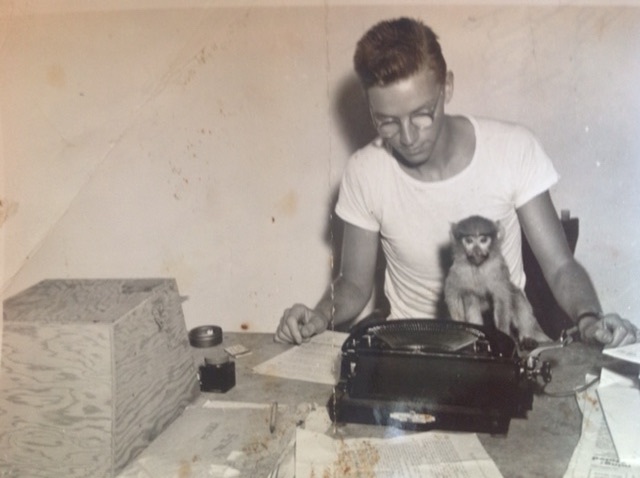 The photo shows him at his typewriter during the war. After the war, Mr. Zweben became a journeyman printer and a member of NY Typographical Union #6. He and Berta made their home in Queens and Long Island. Joe was a linotype operator and proofreader for many newspapers and businesses. The Zwebens retired to Sun City in 1978. Joe was active in ballroom dancing, and served as president and on the board of directors of numerous Sun City dance clubs. He was an active billiard, tennis, and racquetball player, and also contributed articles and poetry to Sun City newspapers. He is survived by his son and his daughter, four grandchildren, and a first grandchild is expected.